“That ye might walk worthy of the Lord, unto all pleasing, being fruitful in every good work, and increasing in the knowledge of God” Colossians 1:10 (KJV). My sister, Marsha, decided God wanted her to become a nurse rather than a veterinarian so she switched from the university to a nearby diploma nursing school. Every weekend, she comes home and teaches a Bible class to my high school friends and me. Little by little, the Bible makes more sense and I feel closer to God. With all my heart, I want to walk worthy of the Lord and serve Him as I grow in His grace. Marsha also introduced me to a home study program that explains the different books of the Bible and doctrine. I have read biographies called By Searching and In the Arena by Isobel Kuhn, and God’s Man in China about Hudson Taylor. Their accounts of sharing the gospel with the Chinese people despite overwhelming hardships enthrall me. The Communist government made all the missionaries leave in 1949 so no one knows how the believers are surviving. I wonder if I will ever visit China? 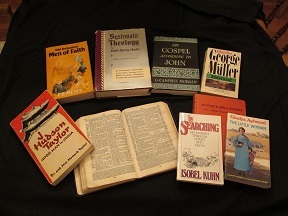 Books that helped in my Bible study and biographies that challenged me. While she was a student in Bible school, Isobel Kuhn learned to put the Lord first every morning to read her Bible and pray. Like Isobel, Psalm 63:1 spoke to my heart. I asked the Lord to help me arise earlier so I could do likewise. What a blessing! I like to write a verse on a card to memorize during the day. Now I silently pray before I take a test at school and ask Him to help me choose the right answer. When I oversleep and miss my quiet time with God, the day never goes as well. After I arrive home, I study the Scriptures for an hour before I start my homework. To my amazement, God multiplies the time and helps me do my school work faster. I thank the Lord for Isobel Kuhn’s example of seeking Him first each day. Over the decades, God has richly blessed me as He speaks to my heart through His precious Word in the morning’s stillness. To my delight, the door opened for me to take a nursing tour of China in 1986 and assist with orphans years later. Please share with us in the comments section a Bible verse or Christian biography that God has used to encourage you. Next postShould I Become a Nurse? I love Christian biographies – it seems to be all I read anymore; awesome to see the testimony of God in so many others. A couple that particularly have been blessings were: The Autobiography of George Fox, and The Memoirs of Charles Finney.